Betta fish are well known for their beautiful tails but do you know all the different betta fish tail types out there? Do you know what type of tail your betta fish has? Which tail type is my betta fish? The following infographic was designed so you and your friends can identify which tail type your betta fish has – or maybe which one you want next! This image is free to use on your website with linked attribution. The easiest way to use this image on your site? Simply copy and paste the code below. The veiltail is by far the most common tail type for betta fish. To recognise it look for a long, flowing, downwards swooping tail. Betta fish with crowntails are a very popular choice. Named because of the spikey appearance of the fins – just like that on the top of a crown. You will be able to recognize a crowntail due to the extended length of the fin’s rays and the small amount of webbing. If the webbing reaches further than 2/3 up the tail’s ray it is not a crowntail. Most breeders aim for the webbing to reach only half way. Combtail betta fish are similar to crowntails in that the tail’s rays are longer than the webbing. However combtails use this feature more subtly. The difference between the fin’s ray and the webbing is not so large. 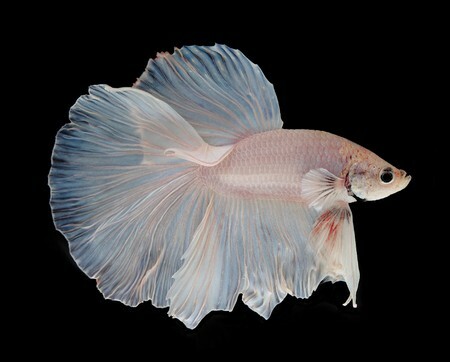 A double tail betta will be recognize due to possessing two distinct tails which are separated to the base. Double tail betta fish also tend to have a larger dorsal fin. Named because of the very clear spade like appearance of the caudal fin. The tail has a wide base which then narrows smoothly to a point. Halfmoon bettas are perhaps the most wanted type of betta fish. The halfmoon tail is large and when flared the caudal fin will fan a 180 degrees which causes the tail to create a half circle – and that is where the name comes from. Over-Halfmoon betta fish have similar fins to halfmoon bettas. The difference is that when flared the caudal fin will fan over 180 degrees creating a shape that is larger than half a circle. A delta tail starts narrow towards the body of the betta fish and widens towards the tip giving it a triangular shape. The difference between this tail type and the veiltail is that if you were to draw a line horizontally across the centre of a betta fish there would be an even amount of tail above and below the line (The veiltail would have most of the tail below the line). The super delta tail type is very similar to the delta tail type however when it is flared it extends further. A super delta tail will flare between 120 to 160 degrees – it does not reach the 180 degrees of a halfmoon tail. The Half Sun tail type is a combination of the crowntail and halfmoon. This results in a large tail with a spread of 180 degrees plus with slight crowning between the fins rays and webbing. The Half Sun is a very rare fin type. The rosetail is a beautiful variation of the halfmoon tail type. The appearance differs from halfmoon tails due to excessive branching on the rays of the fins which causes overlapping on the fins giving a rose like aesthetic. The feathertail is very similar to the rosetail however there is even more excessive branching of the fin rays giving an extra ruffled appearance. Generally speaking the term Plakat betta is used to describe a short finned betta fish. The tail is short and round (sometimes going to a point) on the traditional Plakat. 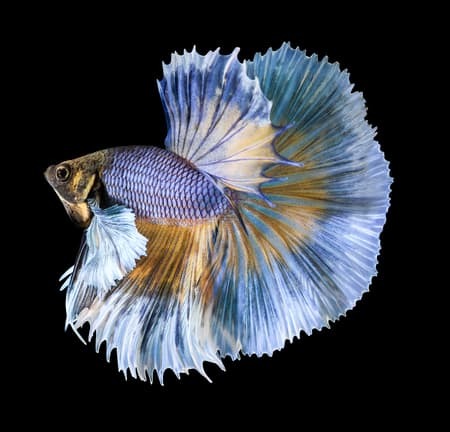 Ok, not quite a “tail type” however the dumbo ear or elephant ear betta fish has a fantastic aesthetic due to its fins. Dumbo ear bettas have extra-large pectoral fins which resulting in these fins looking like elephant ears. These fins can be a matching color to the betta’s body or contrasting. Did you find the betta tail you were looking for? Now you know how to identify which betta fish tail your betta fish has. What do you think of all these betta fish tail types? What did you think about the guide above? We would love to know in the comments. If you know a friend that would love this graphic hit one of the social icons on this page and share! I have a crowntail almost like the one illustrated here, he’s full of character. 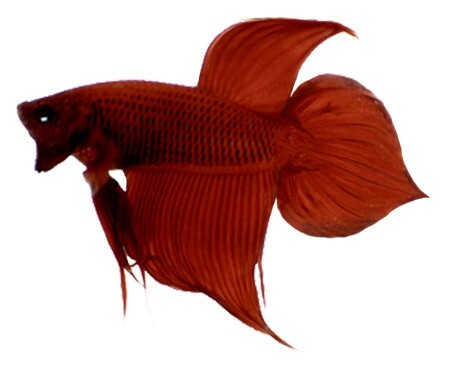 I also have a veiltail, he is a beauiful flame red and very graceful. I have named them Spike and Flash. I did have a cute little elephant ear once but he died. I like the feather tail. Feather and rosetail betta fish are sooo pretty!